BY LEGENDS STAN LEE, JIM LEE, ANDY KUBERT, JOE RUBENSTIEN AND CHRIS CLAREMONT!!!! 1ST FULL GAMBIT CGC 9.6 GRADED SIGNATURE SERIES!!! 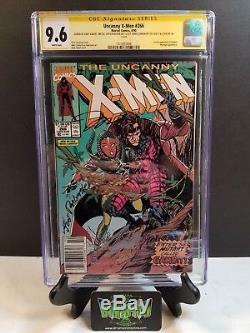 This listing is for 1- CGC 9.6 SIGNATURE SERIES UNCANNY X-MEN #266 1ST GAMBIT GRADED COMIC BOOK SIGNED BY LEGEND STAN LEE, JIM LEE, ANDY KUBERT, JOE RUBENSTIEN, AND CHRIS CLAREMONT!!! ATTENTION: WE ARE CONSTANTLY LISTING HUNDREDS OF SIGNATURE SERIES AND REGULAR GRADED BOOKS WEEKLY, SO BE SURE TO CHECK OUT WHAT WE PUT UP EACH WEEK!! We're sorry but no exceptions will be made to that rule. If your e-Check fails to clear on its first attempt, your order may be cancelled. If a service is not listed, it is not available. You may combine orders over the course of three (3) days. Please keep this in mind when evaluating our performance. Thank you for your consideration. We fully comply with US federal export regulations and cannot declare less than the true final value of your order. Asking us to mark your order as "Gift" or asking us to break any other exportation laws will result in your order being cancelled. We package our items carefully and diligently. We will be glad to assist you in working through the right channels to resolve the issue. Any loss of yours is also a loss of ours, so expect that we are very understanding of any frustrations you may experience due to the mishandling of our products. 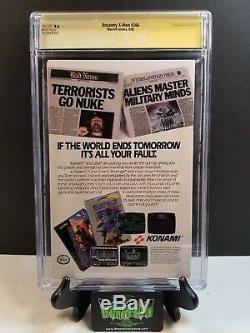 The only exception to this is SEALED items such as statues or other figures/items in enclosed Styrofoam packaging. We will not break the tape on these brand new items out of respect for our fellow collectors, unless specifically ASKED TO DO SO. Thank you for your patience and understanding. We rarely make exceptions to this rule. If you send emails to us we reserve the right to answer them within 48 hrs. We have a high volume of emails to handle so please be patient when expecting a response, especially during times that we are out of state and away for conventions. AS A GENERAL RULE: WE CANNOT ANSWER EMAILS WHILE AT CONVENTIONS. We use an away message for this purpose. If you have an issue, please be PATIENT. We WILL respond as soon as we return. Our feedback should be a clear indication that we take our business and proper customer service very seriously. We are professionals and we are also your friends. We will do everything we can to help you obtain important collector items of the best quality possible and get them to you safely. If you would like any information regarding our whereabouts at conventions so that you may visit our booth, please let us know! We would be glad to meet and assist you! If you fail to receive emails from us, please check your SPAM filter. 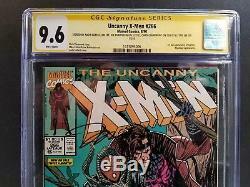 The item "UNCANNY X-MEN #266 CGC SS 9.6 5X SIGNED STAN LEE JIM LEE CLAREMONT 1ST GAMBIT" is in sale since Tuesday, May 1, 2018. 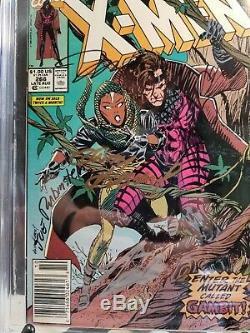 This item is in the category "Collectibles\Comics\Copper Age (1984-1991)\Superhero\X-Men". The seller is "dimensionxcomics717" and is located in Harrisburg, Pennsylvania. This item can be shipped worldwide.